Wrapping wontons is fun and not as daunting as it looks. Learn how to wrap wontons with these different techniques. This post shows you two basic methods plus seven more fancy methods to wow your family and friends. One of my favorite foods to make and freeze ahead is wontons. They are so convenient for busy days. 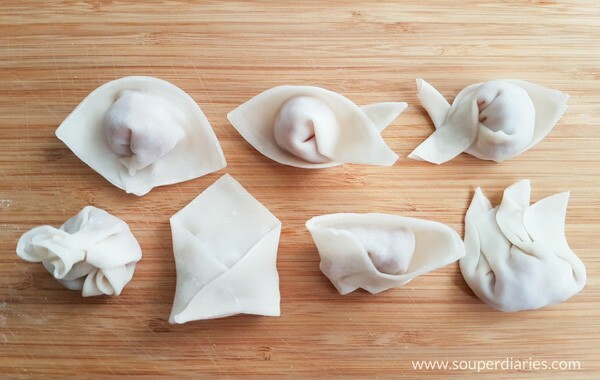 Just pop the frozen wontons into your soup stock and you’ll have a delicious meal in minutes. There are various approaches to folding wontons and I will share some of them here. How is Different Wonton Shapes Useful? 1. If you’re wrapping wontons with a few types of fillings, use different wonton shapes to distinguish the filling inside. 2. Wrapping a big batch of wontons can get monotonous after awhile, so using different wrapping methods help to relieve the humdrum and make it a fun process. 3. Experimenting with different ways to wrap wontons will help you to find out which is your favorite method. A small bowl of water. A cheesecloth or towel to cover the wonton skins and wrapped wontons. Kitchen paper (for wiping your hands). A large tray or baking sheet lined with parchment paper (the parchment paper prevents the wonton from sticking to the surface of the tray). Almost all wonton wrapping methods are an extension from either the triangular or rectangular shaped wonton. 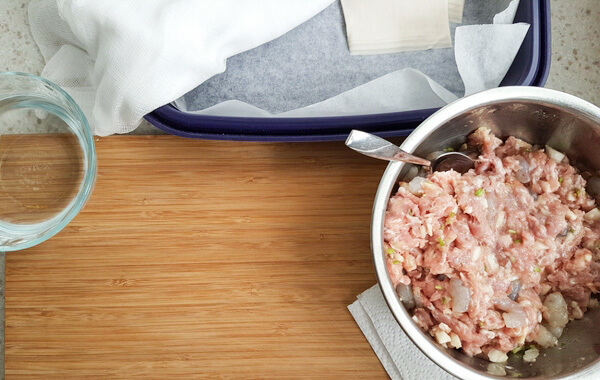 They’re the easiest and most straightforward way to wrap a wonton. Tip: Whichever way you want to wrap wontons, make sure they’re sealed properly so that the contents of the wonton will not leak when it is cooked. Place about a teaspoon (or more if you wish) of wonton filling onto the center of the wrapper. Dab a little water on the edges of the top half of the wonton wrapper. 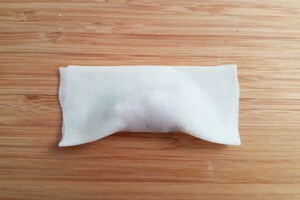 Fold up the wonton skin into half to form a rectangle. Press to seal and smooth out air pockets. Dab a little water on the edges of the top half. 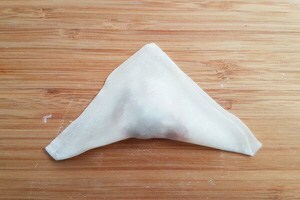 Fold the wonton into half to form a triangle. Start with a rectangular wonton. Wet the bottom left corner of the wrapper. Hold both corners of the wrapper and fold them to the center. Press to seal the wonton. This method is quite similar to the rectangular ingot, except that you start with a triangular wonton. 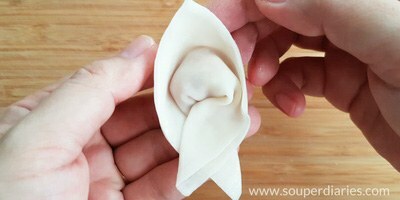 Hold both corners of the wonton and fold them into the center. Dab a little water on the left corner of the wonton. Fold in the right corner and press to seal. Note: For the last step, you can also let the two corners overlap (as shown in the picture above) so that it looks like a tail. 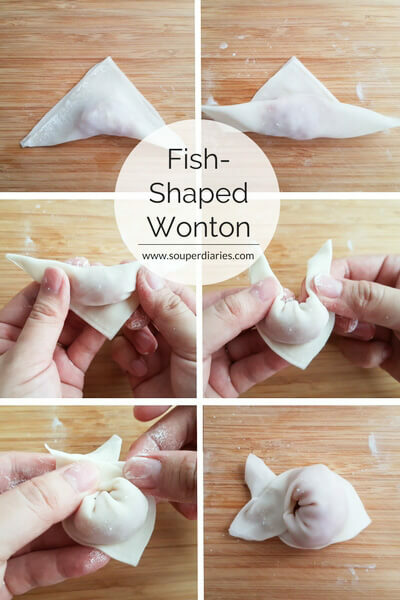 This cute fish shaped wonton requires a little dexterity as the skin will tear easily (especially if you put in extra fillings) if you twist it too hard. Roll up the wonton and leave a little space on top to form the mouth of the ‘fish’. Turn the wonton upside down. Wet the place where your left thumb pinches. Twist the two corners and seal them. Start by forming a rectangular wonton. Hold the left corner. Lift up the bottom slightly and fold it into the center. Wet the spot where you place your left thumb on the wonton. Fold in the right corner. Press and seal. 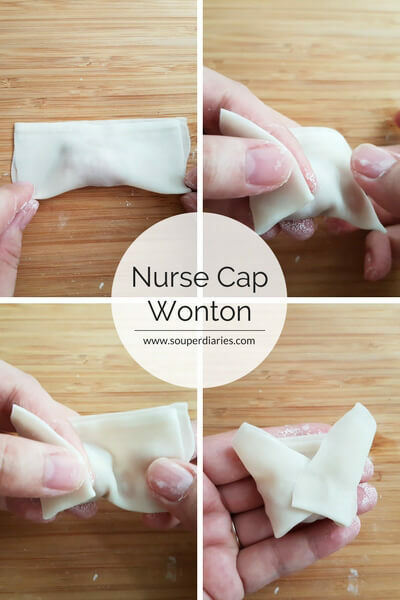 This is my personal favorite way to wrap wonton. A cute purse to hold your goodies! Pleat the top of the wonton. 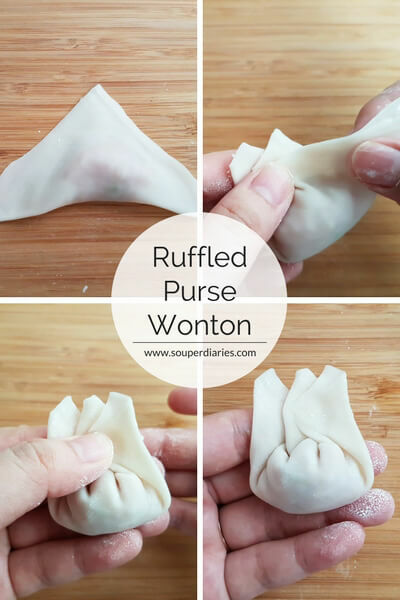 Make around 3 to 5 pleats depending on how ‘ruffled’ you want the wonton to be. Press the top to seal tightly. Tip: Keep unused wrappers refrigerated and sealed from air so that they won’t dry out. 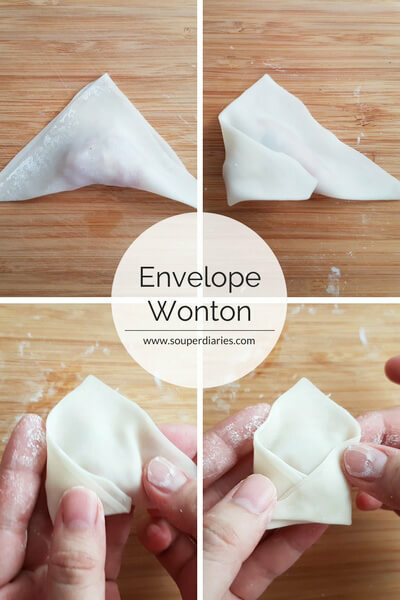 Simple and straightforward, the envelope shaped wonton is easy for a beginner to learn. This method is great for frying. 1. 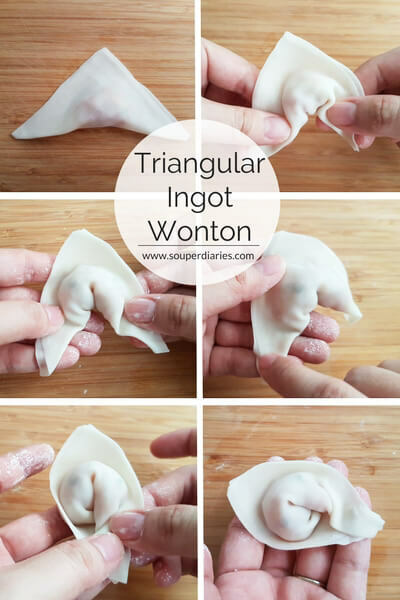 Form a triangular shaped wonton. 2. Fold in one corner of the wrapper and wet the corner with a little water. 3. Fold the other corner and seal. 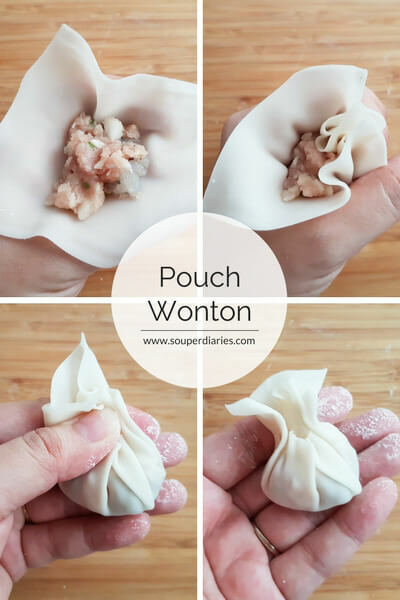 This scrunching method is great if you want to fill your wonton with slightly more filling. For this shape, it is not necessary to wet the edges. It’s my daughter’s favorite way to wrap wontons. Scrunch up the wrapper with your thumb and fingers. And it’s a wrap! What is your favorite way to wrap wonton? Share with us in the comment box below! For more ideas on how to wrap wontons, check out this video below. Both round and square wrappers are included in the video. This was a cool article. I learned something today. Can you put anything you want in this Won-Ton? You know some things are just inappropriate and mess up the meaning behind a recipe. I haven’t tried preparing wontons, but the way you showed these different ways of doing it, makes it look fun and interesting. Will definitely try it one of these days. I enjoy the envelope shaped wonton the best! I love wontons! They are so delicious with soups and salads! Is there a brand that you recommend? For wonton soup recipes, use the thinnest wonton wrappers that you can find. The thicker ones are more suitable for deep-frying. A really good article on a very popular food. I personally like the idea of using different shapes to distinguish different fillings, great idea! I have always thought that wontons were extremely difficult to make as they look so complicated and delicate but you have shown that they are quite easy to make, well, it looks easy but I will have to try myself later on today when I have some spare time without my children around so they don’t disturb me, lol. 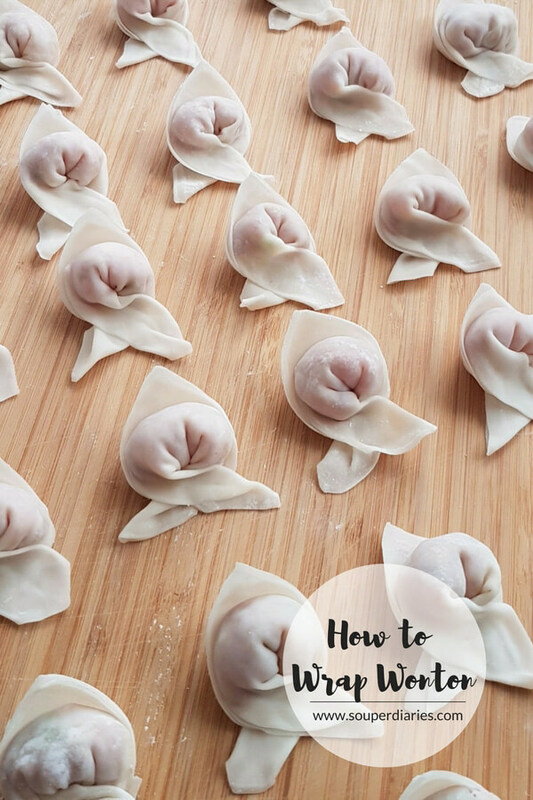 Thanks so much for this tutorial on wrapping wontons. What is your favourite wonton filling if you don’t mind me asking? I used to think that wrapping wontons was complicated too. But once you get the hang of it, it’s actually quite easy. I like the classic filling or shrimp and pork. You can find the recipe for that filling here. Very comprehensive information on how to wrap wontons. I had no idea there were so many different types of wrapped wontons. Next time I go to a Chinese restaurant, I will pay closer attention, and may even ask for a special wrap. It may even make them taste better. Thanks for sharing this. This is SO helpful. 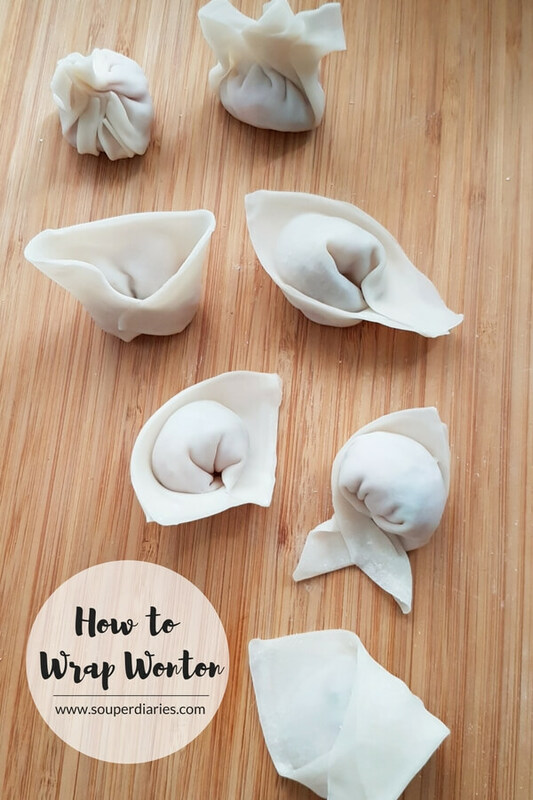 I’m making wontons for the first time for the holidays but I needed a really detailed guide on how to wrap them. love the step by step pics, thank you! This is fantastic! My mom LOVES wontons, but unfortunately the local Chinese restaurant around here don’t do them justice anymore. I’ll definitely have to show her this! Wontons are something I always eat when going to a chinese buffet. I have never tried to make them at home by myself, but your article is very interesting and shows clearly how to make them. I also loved that you added a recipe so I can go ahead and make a delicious soup. What do you prefer in your wontons? I see you had the strimp recipe there, but is there one that is better than the other? Is there one that is typical chinese? For me, the classic pork and shrimp combination is the best and commonly used as a filling for wontons. You may also use just shrimp, pork or chicken alone if you prefer. Hi Yvonne, cool post about the wontons. I lived in Taiwan for 5 years and I miss this kind of food so much. So, I’m trying to make some myself. Thanks for the help and pointers…we’ll see how this goes! I love wontons! And only know how to do the ruffle wontons. And not in the nice and pretty way you shown how. Thanks for this awesome article. It really helps us to understand more about wontons and how to wrap them in such creative ways. I will definitely try to create such prettier wontons from today. And the video was very helpful too. Once again, thank you so much! Gonna bookmark your page! Boy, you can really get fancy with them! i never knew that! 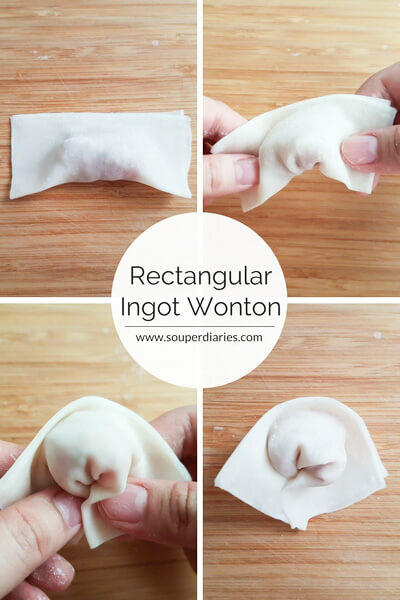 I only knew how to do the Triangular Ingot Wonton.. and I didn’t even know that’s what it was called! I learnt something today! thanks! Wow! I never realized there were so many different ways to wrap a wonton. I will definitely be trying some of these out soon. Thanks for sharing. Wow! This really simplified wrapping wontons for me. Great pictures and easy to follow instructions. Thanks! I may try making wontons sometimes now. Wow! What an awesome guide. My wife and I attempted to make dumplings a few weeks ago and failed miserably, but this looks like the perfect comprehensive guide. We’ll have to give this a shot. It reminds me of when I go to Din Tai Fung in Seattle and there are like 25 people working on wrapping/rolling dumplings and wontons in a huge room. These look amazing. Thanks for the wonderful guide :). Out of curiosity, do they pretty much all cook and last equally, or is there one that keeps together better? Wow, I didn’t know that Din Tai Fung has outlets in Seattle. It is also very popular in Singapore and the queues are always long. The wontons cook at about the same time. Just take one out to test that the meat is completely cooked when they float up. All wontons freeze well. I don’t think there’s any difference to the expiry date of the wontons. This is wonderfully helpful! I have made eggrolls, but have never attempted wontons. Your detailed instruction makes it look easy. I will give this a try! Thank you so much for all of your time and effort in sharing with everyone! Good and clean tutorial. I think I learned how to make wontons with Pouch Wonton. It is the easiest way for me. Thank you, I am hungry now. Thanks for the info, the pictures were very helpful and I enjoyed reading your post! I love wontons, anytime I go out for Chinese food everyone knows I will be ordering dumplings or wontons as an appetizer. I never thought to try and make them at home, but this makes it look pretty doable.